Google ‘stretch marks’ and your computer screen will fill with articles claiming to uncover the truth of how to get rid of stretch marks. The internet will tell you stretch marks are an imperfection, and they need to be ‘treated’. It’s part of a culture where women are taught to hate their bodies. This starts in adolescence, even earlier for some, as women’s bodies are placed under the microscope and criticised by the media. Stretch marks alone could see a celebrity mocked in some celebrity gossip magazines in a world where famous women are routinely Photoshopped to remove any so-called imperfections. What Happens When We Believe The Media Hype? And so, women are raised to hate their bodies. They believe their breasts are too small, their stomach too fat and their pubic area too hairy. Women are supposed to look perfect all of the time, just like in the magazines. Women are not taught to celebrate their bodies’ achievements. They are not celebrated for running fast or being strong or being healthy – it’s all about the aesthetics. Even during pregnancy, as your body does pretty much the most impressive thing a body can do, women’s bodies are judged for how they look. Society should be in awe of women’s bodies making babies, but instead they’re busy trying to sell stretch mark cream to women who are terrified of their changing bodies. Expensive stretch mark creams line the shelves of supermarkets and pharmacies. Pregnant women spend a lot of money on these lotions in the hope they will avoid the dreaded stretch marks. There isn’t much evidence these creams work. Whether you get stretch marks or not is most likely down to your genetics. Those creams are just a way of making money by feeding into body insecurity and making pregnant women feel bad about their changing bodies. The women on the pages of glossy pregnancy magazines don’t have stretch marks. They have perfectly smooth bumps, pedicured toenails and show-home nurseries. They’re not real women, but when they’re the only representation of pregnant women in the media, you can be forgiven for feeling like you’re coming up short when you don’t look like they do. Luckily, finally, things are starting to change. Only little changes, but changes nonetheless. Fashion brand ASOS recently decided to show their model’s stretch marks in untouched photos. That might not sound huge, but it’s great to celebrate women’s bodies as they really are. Teenage girls don’t always realise that images have been Photoshopped, so they grow up feeling bad about themselves for having normal bodies. ASOS deciding to showcase real bodies is huge, it has the potential to positively impact how teenage girls view their own bodies. Barcelona-based artist Cinta Tort Cartro is part of a worldwide movement to empower women and help them love their bodies. 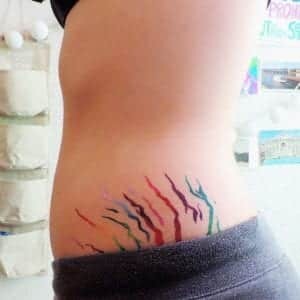 The feminist artist creates beautiful works of art using women’s stretch marks and shares the images on her Instagram where she has almost 30,000 followers. Using brightly coloured rainbow paints, Cartro highlights the stretch marks of the women in her photographs to showcase the beauty of the marks. In another post, she wrote: “Watch them, read them, discover them and love them. Stretch marks. From very small ones they make us hate everything we have in our body and constantly try to eliminate everything that is not normal for them: stains, freckles, hairs, and an endless number of other things, and…stretch marks. Your body has been through a lot – conception, pregnancy, birth. Your body made a baby, grew it, birthed it, nurtured it. Isn’t it time to stop judging your body based on the media perception of what women should look like? Isn’t it time to pause for a moment, think about the amazing things your body has done, and learn to love your body in its current form? And, most importantly, don’t let your daughters hear you criticising your body. When they ask you about your stretch marks, tell them proudly that they are the fading physical reminders of your journey to motherhood, that they helped your body to make room for a growing baby, and that they are beautiful. If you want your daughters to grow up loving their bodies, make sure they see you loving yours.